What I have learnt from these incredible resources is shoulder care goes beyond the strength of the individual rotator cuff muscles – we have to look at the entire body. While it is beyond the scope of this article to look at the entire body I will dig into 4 different areas that need to be addressed to ensure overall shoulder health. Reflexive Rotator Cuff Training – As a group the rotator cuffs job is the reflexively stabilize the humeral head so we need to train it do this. Scapular Stability – The scapula must be in the right position of the rotator cuff muscles to function properly – if the scapula is misaligned then the individual strength of these muscles matters not. 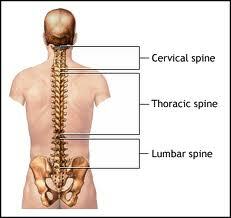 Mobility in the Thoracic Spine – imperative for optimal performance as well as avoiding injuries. Breathing Patterns – we do this exercise all day everyday but if we don’t do it the right we might lock up some muscles that will restrict our mobility and steal power that we could have produced. This holistic approach respects the fact that our bodies are essential long chain and a weak link can cause a host of problems almost anywhere along this chain. If you have an injury due to throwing and focus your attention solely at the site of pain you might miss the boat in trying to figure out what caused the problem in the first place. This is why top therapists will take a look at how the body is functioning near the site of the pain to look for some usual suspects which are at the root of the problem. Let’s use an analogy here to explain what I am talking about. Jonny and Billy are paired up to do a project and are both assigned 50% of the work. Billy is a slacker and doesn’t do his fair share which forced Jonny to do the majority of the work all by himself. Who do you think would complain about this situation? Jonny!!! But who do you think is causing the problem? Billy!!! If your shoulder hurts you will probably have to do some work to repair whatever damage has been done but if you want to avoid this problem from reoccurring you are going to have to find the root of the problem. This series went into great detail of what each rotator cuff muscle does individually when we concentrate on isolation which is important to ensure each muscle has the necessary strength to do its job. However as a baseball player you need the rotator cuff to dynamically stabilize the head of the humerus so that it stays in the “sweet spot” within the glenoid fossa because if it doesn’t then bad things can happen. 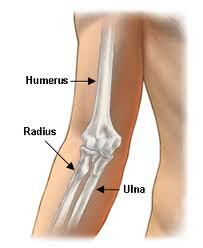 Throwing a baseball as fast as you can to a very specific spot with someone swinging a bat is hard enough as it is so imagine how tough it would be if you had to tell your supraspinatus to pulldown on the humerus just enough to centre the humerus within the glenoid fossa. Luckily your rotator cuff is designed to provide this stability without you having to think about which is why I refer to it as reflexive conditioning/stabilization. Because the GH joint (a.k.a shoulder joint) is so mobile we need for the joints on either side to be stable (joint by joint approach – Boyle et al 2008 – not a real reference but it deserves mention). 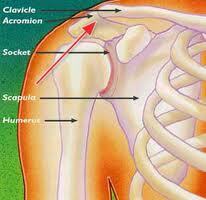 The joints that anchor the GH joint are the elbow and scapulothoracic joints. It is easy to see why the elbow joint is made for stability with the bone on bone connections but the scapulothoracic joint pretty much just floats on top of the ribs with only one little bone on bone connection at the acromion-clavicular (AC) joint to provide some stability. The rest of the stability demands fall on the muscles that connect it to other bones in the body and must keep hanging in exactly the right place. There are 18 different muscles that have some type of connection with the scapula; some have a tendency to become tight pulling the scapula out of position causing others to become weak and allow for a misplaced scapula. When you where about the traps you think of big body builder with no neck from doing lots of shrugs. This big muscle does cause you to shrug your shoulders but only the upper part – the traps can be divided into an upper, middle and lower portion because the fibers run at different angles and do different actions. Just like the deltoids which are divided into an anterior, middle and posterior groups which each produce different actions. Lower portion – upward rotation and downward depression. 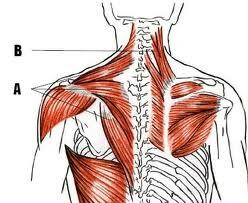 The lower traps are going to be the part of the traps that we are going to focus on the most because they are the most neglected and will help us keep our shoulders strong and healthy if they are working properly. The reason for this is that they help tilt our scapula posteriorly as well as external rotation during arm elevation which decreases the chances of a sub-acromial impingement injury. This muscle holds our scapula against our rib cage. 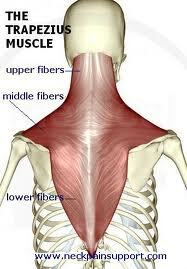 If this muscle is weak it allows the scapula to “wing off” from the rib cage. 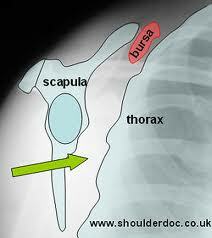 Its action along with the pec minor is to protract the scaulea – this means to pull your shoulder blades apart. Hold your arms out in front of your with your elbows locked standing nice and tall – should look like Frankenstein. 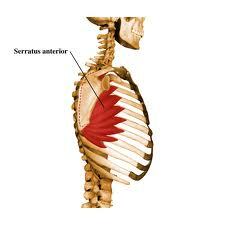 Now try to reach just a little further by allowing your shoulder blades to be pulled apart – that is the action of your serratus anterior. The most common exercise for the serratus anterior is what’s called a pushup plus where you do what I described previously only that you do it from a pushup position. In order to make it better try elevating your feet and placing your hands in a diamond position underneath your forehead. (Lear et al. 1993). As a society we have the tendency to sit down way to often and for too long which results in hunch backs rob of us mobility we could have used to generate more velocity. When we sit down most of us go into a flexed position within our T-Spine and when we throw we want to have the ability extend and rotate. My next post will give you a couple of drills to do that will help restore some of this lost mobility but you need to avoid being in a flexed position as best you can no matter if you are sitting or standing. 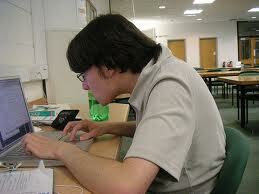 Thirty to Sixty minutes a week of mobility drills do not stand a chance against countless hours of poor posture. Often times you hear a coach telling their athletes to relax and breath – this is great because it will help free up this locked t-spine area. Breathing is really important and often overlooked if you think about it half of each day you are in a state of inhalation while the other half is spent in exaltation. If you do something all day everyday you need to master this movement to ensure you are doing it the right way. Lie on your back with your knees bent at 90 degrees so your feet are flat on the ground – place one hand on your stomach and the other on your chest. Take deep breaths pulling in lots on air then exhale about 90 percent of the air in your system – this is essentially exaggerated breathing but you should only feel the hand on your stomach moving while the one placed on your chest needs to be still. This means that you are using your diaphragm to breathe which is what is it specifically designed to do. “Chest” breathing puts undue stress on muscles like your pec minor which as a result can become tight and overactive restricting your mobility. Practice this one as much as you can and since you need to breathe all day everyday don’t tell me you don’t have the time. The “new” arm care program/pre-hab must go beyond your basic rotator cuff muscles to ensure that the whole system is working. I will try my hand doing a couple of videos to show you my favorite drills and exercises for all of these different areas that I discussed.